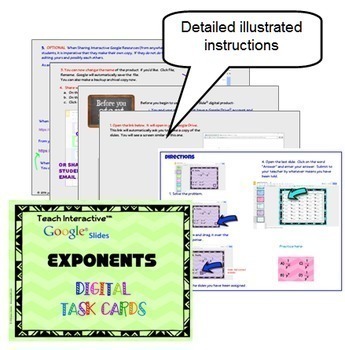 Algebra Exponents, End of Unit Practice with Google® Slides, Digital Interactive Task Cards - Paperless and NO Prep for you! 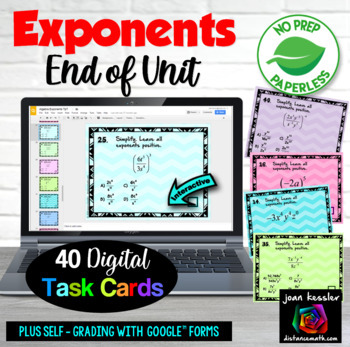 This fun interactive End of Unit activity for Algebra reinforces all the concepts taught in the unit on exponents and is a great way for your students to practice simplifying expressions using the laws of exponents. Laws included are product rule, quotient rule, power rule, negative exponents rule, zero exponent rule. Your students interact with the slides to choose the correct answer, differentiating between similar choices. 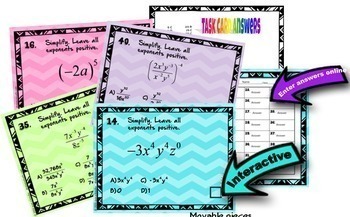 This activity includes 40 digital task cards plus a digital answer sheet. A printable answer sheet is also included should you want that for a blended activity. Detailed illustrated instructions on accessing and sharing this resource with your students is included as well as the link to the product. Why Use Teach Interactive™ Google Resources? ✓ Completely paperless, no printing, no lost assignments, and NO PREP for you. 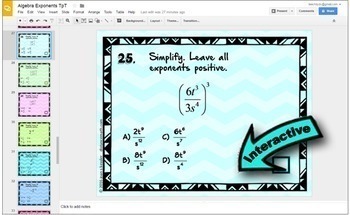 ✓ Students work directly on their own pages or work collaboratively - your choice! ✓ Students can organize their materials in their own Google Drive. Great for Review!